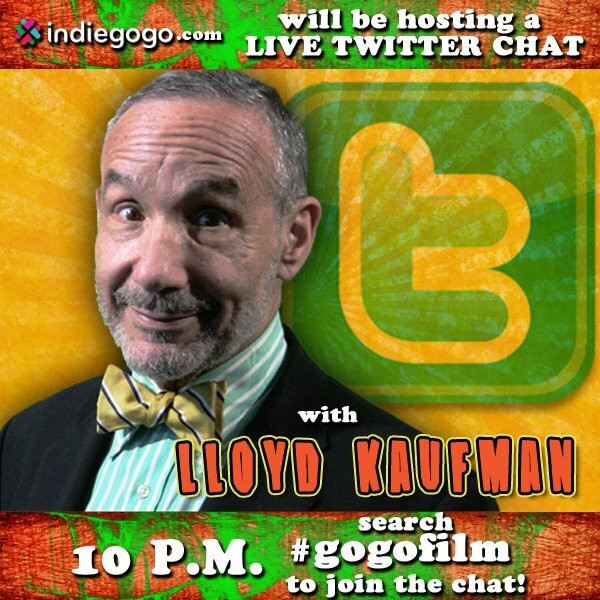 IndieGoGo.com To Host Live Twitter Chat With Lloyd On JANUARY 31st at 10PM!!! Twitter users can access the chat using the standard Twitter interface by putting the hashtag “#gogofilm” into the search engine which will then show all users chatting about the subject. Please be sure to have the #gogofilm hashtag in all of your tweets/responses! Users may also use the chat tool TweetChat, which you can log into using your Twitter account. By inserting a hashtag, you are directed to a Twitter chat room. Tweetchat will automatically add the hashtags to your tweets and responses. This announcement comes as Troma Entertainment has appeared in numerous mainstream media outlets with its launch of an indiegogo.com campaign for a brand-new documentary, entitled, Occupy Cannes, a follow up to Troma’s acclaimed 2002 documentary All the Love You Cannes. In addition to serving as a guide to the Cannes Film Festival for independent filmmakers, Occupy Cannes will document the world premiere of Return to Nuke ‘Em High Vol. 1 at the 2013 Cannes Film Festival. This entry was posted on Tuesday, January 31st, 2012 at 5:34 pm	and is filed under Events, News. You can follow any responses to this entry through the RSS 2.0 feed. You can leave a response, or trackback from your own site. You are here : Home » news » 2012 » 01 » 31 » IndieGoGo.com To Host Live Twitter Chat With Lloyd On JANUARY 31st at 10PM!! !